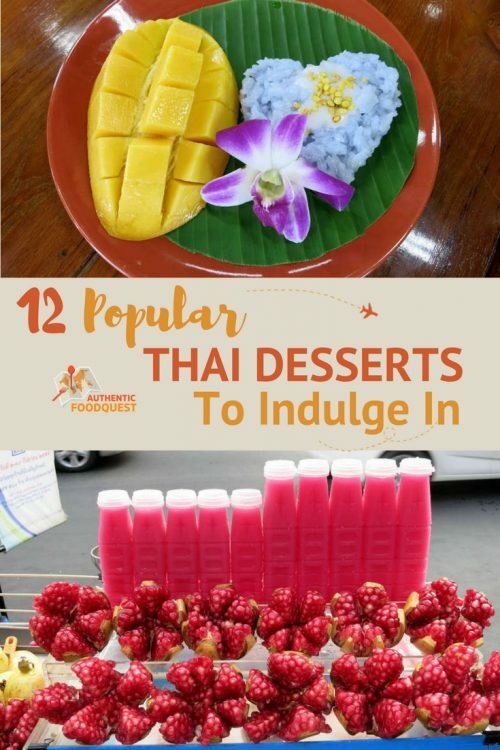 Writing about Thai food without mentioning the Thai desserts would be missing out on the vast array of sweets, that are part of Thai cuisine. Thai desserts reflect Thai cuisine in the way certain ingredients are used notably rice, coconut, and fruits. Thai desserts are known as Khanom in Thai or sweet snacks. We believe that eating Khanom is a great way to end a meal and smoothen the palate after eating spicy Thai dishes. This article has been updated for a total of 15 popular Thai desserts. 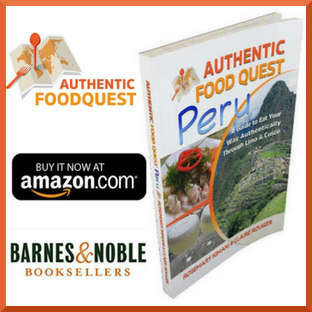 We have also included additional resources to help you find and enjoy their unique tantalizing tastes and flavors. Let’s indulge in the delightful and popular Thai desserts. Article updated on February 5th 2019, with additional desserts and resources. Sticky rice is a very particular staple of Thai cuisine. It is grown mainly in Southeast Asia from a specific variety of rice (with opaque grains) that once cooked, stick! Making sticky rice is not easy and it is very time consuming. There is an art to making the rice sticky enough so the grains stay together. And not too sticky so when eating with your hands it doesn’t stick to you! Many traditional Thai desserts are made using sticky rice. Here are the three most popular sticky rice based desserts. Mangoes are native to Southeast Asia and Thailand is the third producer of mangoes worldwide. Mango sticky rice is available everywhere at different price points. Typically, the vendor slices the mango and prepares this Thai dessert in front of you, before handing over the styrofoam container with this delicious dessert. 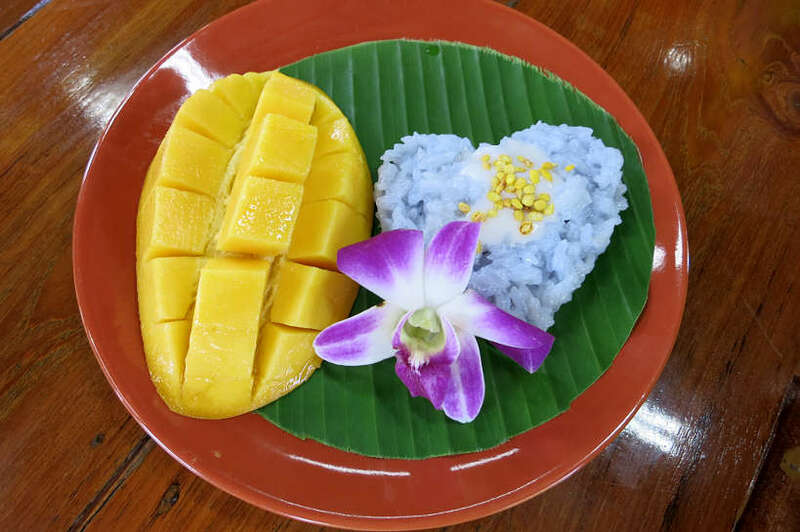 Mango sticky rice is made with fresh mangoes cut into slices and placed on top of a bed of sticky rice. A sweet coconut milk is then poured over the mango and sticky rice. The dessert is topped off with a sprinkle of fried mung beans. It is of our favorite Thai dessert and we always look forward to enjoying it in Thailand! Your best bet to find mango sticky rice is at the local market. You will also find it at restaurants, though outrageously priced. The typical price for mango sticky rice at the market is about 40 baht ($1.14 USD), whereas at restaurants, it can run you anywhere from 120 baht ($3.42 USD) to 180 baht ($5.13 USD). This is another version of the previous Thailand dessert. This time the famous Durian fruit replaces the mango. Durian is often called the “King of Fruits” in Southeast Asia. It is also a popular filling in Vietnamese desserts. There are more than 300 varieties of durian fruits in Thailand! Though only a few are edible. The durian fruit is very distinctive with its large size, thorned skin, and more or less pungent odor. Durian sticky rice is prepared the same way as the mango sticky rice. Though most of the time the fruit has been sliced ahead of time. It is harder to find durian sticky rice as compared to the mango sticky rice version. Your best bet will be to ask a vendor with mango sticky rice, if they can make you one with durian. We had it a local street vendor and it was priced the same as the Thai mango sticky rice. This is another famous Thai dessert not to miss while in Thailand. This time the sticky rice is roasted in Bamboo sticks over charcoal. You will find different kinds. Some with black beans, sesame or different types of sticky rice, like black sticky rice. 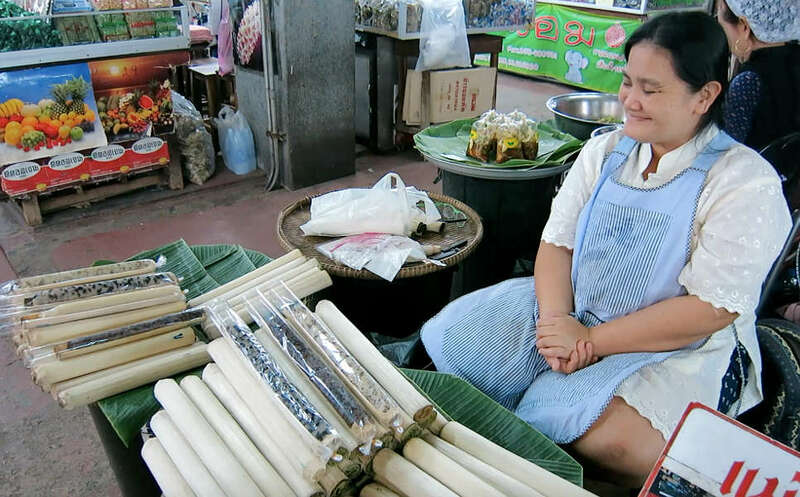 Interestingly, in Cambodia, bamboo sticky rice, is a popular Cambodian street food. While it is prepared in the same way in Thailand, the rice used in Cambodia is a special fragrant rice from specific provinces of the country. The rice takes the flavor of the bamboo giving it a unique taste. Ultimately, the experience of eating a bamboo sticky rice is what makes this dessert so appealing! 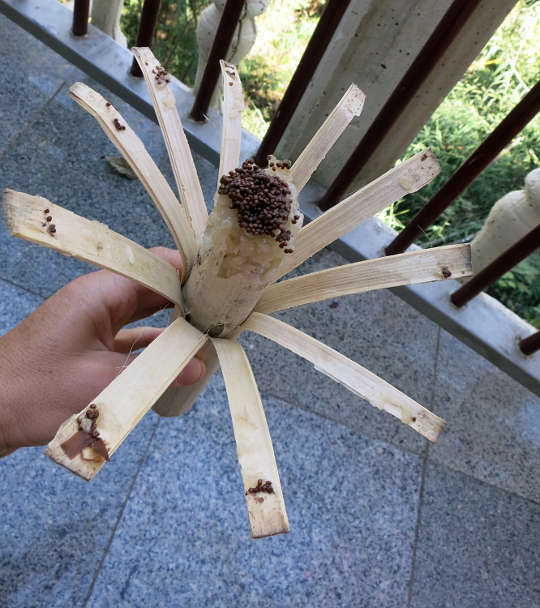 The best way to eat it is to crack the bamboo open from the top, and then pull down strips of bamboo slowly. Once you have peeled down a few strips around, you can them grab a piece of sticky rice and eat with your hands. It is not easy to find this unique Thai sweet. The best places to find it is at street fairs or certain markets. We had it at Warorot market in Chiang Mai, near the sweets section. The costs range between 50 baht ($0.143 USD) to 80 baht ($2.28 USD) depending on the size you choose. This delicious Thai dessert is made of sticky rice with coconut milk and a filling inside. There is a saying that Kao Tom Mud symbolizes a couple’s life since they usually pair two Kao Tom Mud together tied with a bamboo strip. We had it with black beans, tamarind and banana. You can also find it with taro as well. 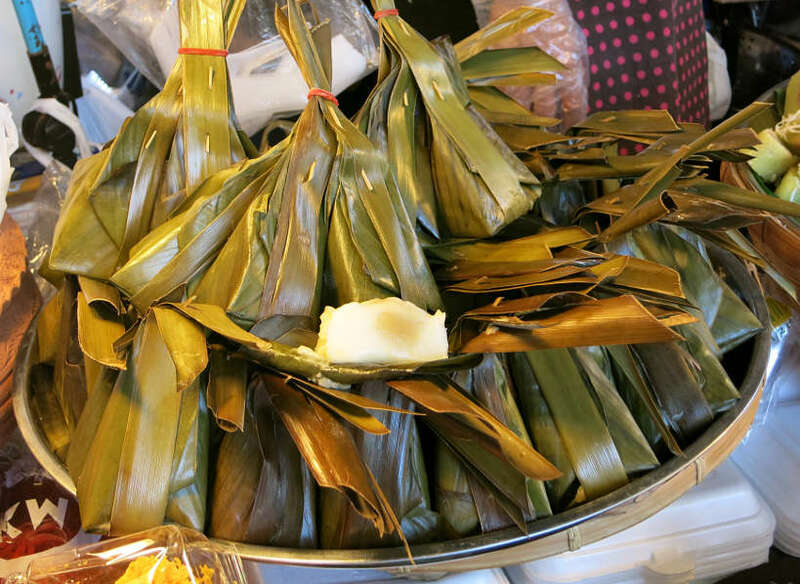 Wrapped in a banana leaf, it is deliciously sweet and slightly chewy. You can easily eat it in just two or three bites! 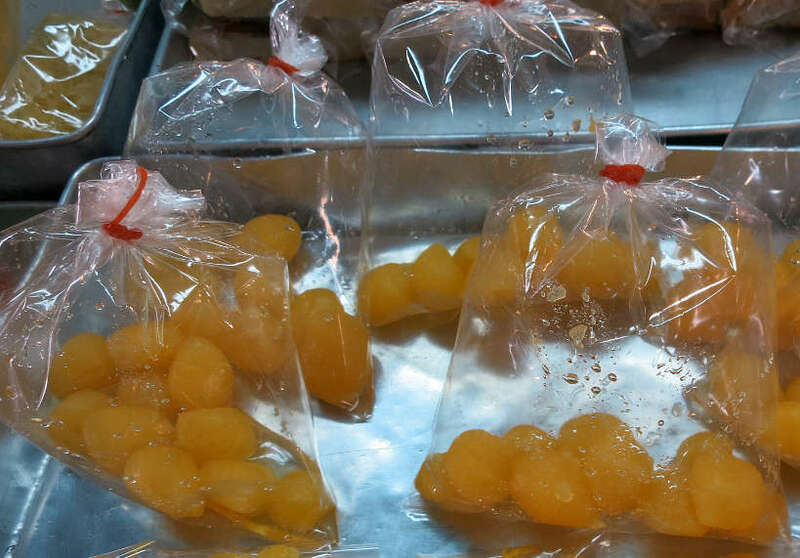 This popular Thai dessert is most likely found at the markets. It is also sold at street carts on sidewalks next to savory street foods. The cost for this sweet treat is about 5 baht ($0.14USD). These small triangular banana leaf wrappings will grab your attention as you peruse the street food vendors in Thailand. When we asked what was inside, we were quite surprised to hear “coconut”. The street vendor seeing the curiosity on our faces offered to open one up and let us taste it. The inside is filled with a creamy filling and a brown colored center with tamarind flavor. The consistency of this Thailand dessert is similar to jelly on the outside while the tamarind filling is slightly chewier. Easy to eat as a snack, it is not too sweet and the tamarind flavor balances out the coconut. The most popular place to find this traditional sweet is at the local markets or street carts. 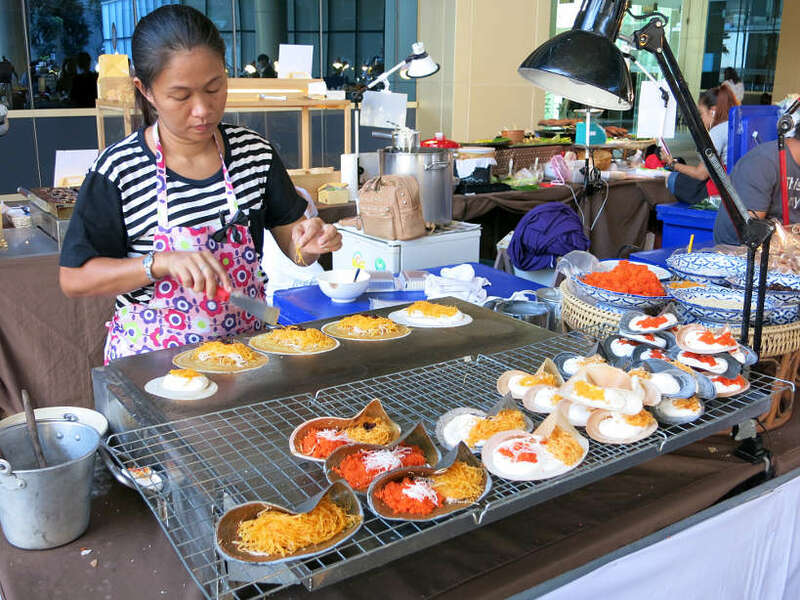 This Thailand dessert is homemade and every vendor has their own way of making it. Try the different kinds you will find. Our favorite was the one filled with tamarind. The price is similar to the Kao Tom Mud, at about 5 baht ($0.14USD). Ice cream in Thailand is a popular treat to cool off from the heat and humidity. Thai ice cream also called I-tim in Thai, is typically made without the use of dairy products. The flavors are quite unique and include durian, jackfruit, taro root and even corn. The two most popular types of ice cream are coconut ice cream and Thai popsicles. Coconuts are used in many Thai dishes and it is no surprise to see them used in desserts. The ice cream is unique in that it is made completely with coconut milk. The Thais, like most people in the Asia, do not easily digest lactose (sugar that occurs naturally in milk). Without the lactose, coconut ice cream can be enjoyed without the side effects of dairy. The texture is not creamy like milk based ice cream and not as icy as sorbet. It is a refreshing blend between the two. Cool off with this delicious Thai sweet for the mere cost of 20 baht ($0.57USD) to 30 baht ($0.86USD). 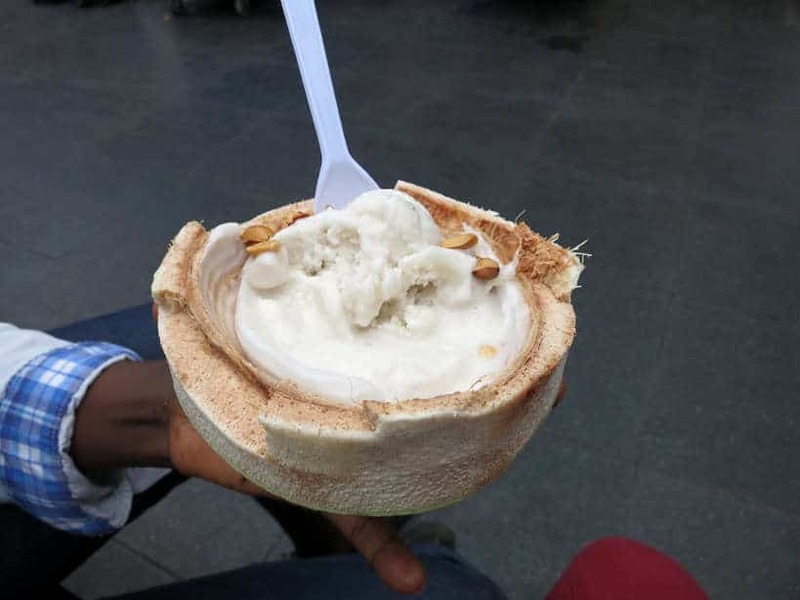 Coconut ice cream served in coconut shell with coconut strips. In a huge circular stainless steel pot, you will see a vendor sitting on a little chair, shaking the pot back and forth. In the pot are several tubes that are fitted onto the pot each filled with different flavored icy popsicles. The flavors range from soda’s like cola, grape, lemon to fruity flavors like mixed fruit, orange or strawberry. While intensely sweet, it is worth sampling these treats for about 5 baht ($0.14USD). In the hot temperatures, you will not have a problem finding ice cream vendors. They will find you. Cruising down the streets on bicycles and motorbikes, you will hear vendors with bells or music ringing to get your attention. 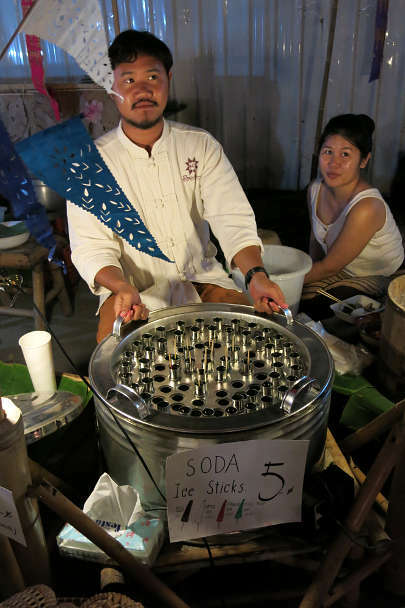 At local markets or popular events, popsicle vendors will place themselves and their large pots on the main alleys, ensuring that you do not miss them. In either case, indulge in the lactose free Thai ice creams or popsicles. These crispy pancakes will grab your attention as much as they grabbed ours when we saw them for the first time. They are a traditional Thai sweet street food that are meticulously prepared. 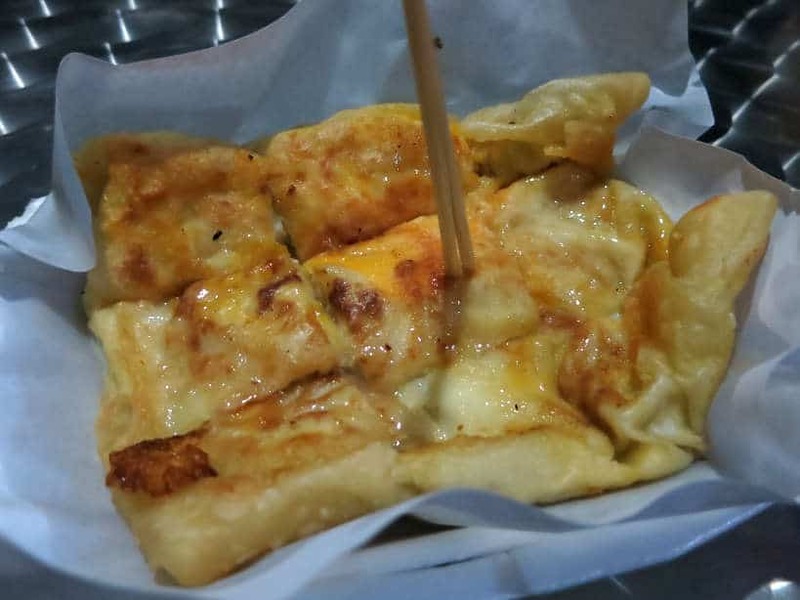 The base or the crispy pancake is made of rice flour and mung bean flour. Coconut cream is topped on the small pancakes before fillings are placed on it. You will find two types of toppings, sweet and savory. The sweet fillings has shredded coconut and golden threads (egg yolk strips). The salty filling contains shredded coconut, chopped spring onions and shredded shrimp. We enjoyed these snacks with a preference for the sweet ones over the salty ones. You will find vendors selling them at popular street corners. The costs will set you back about 25 baht ($0.71USD) to 30 baht ($0.86USD) for a set of 5 small crispy pancakes. Thai roti is the Thai version of the roti, an Indian flatbread made of wholemeal flour traditionally served savory. The Indian roti has been adapted in many Southeast Asian countries. In Thailand, the roti is said to have originated from the Southern part of the country. 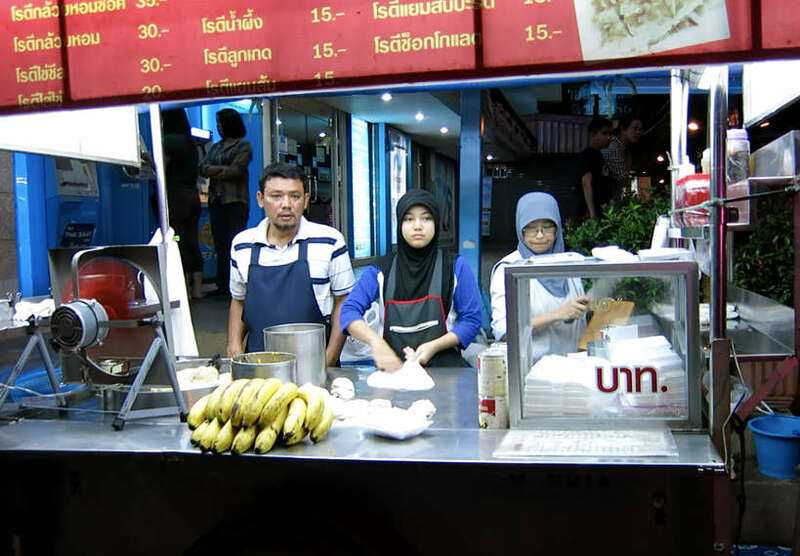 The Muslim community adapted the Malaysian roti to Thai tastes and preferences. Often sold by Muslim vendors, you will see long lines of people waiting to place their orders. The most popular is the Thai banana roti also called Roti Gluay. The Thai roti is fried dough cooked in a large wok with lots of butter or margarine. Depending on your order, different sweet stuffings are added. The most common are banana and sugar topped with sweetened condensed coconut milk. Thai roti is hugely popular and is sold on street carts in popular street food locations throughout Thailand. We enjoyed Thai Roti both in Bangkok and Chiang Mai. Our favorite place was on Huay Kaew Road and Canal Road in Chiang Mai, across the 7-Eleven. 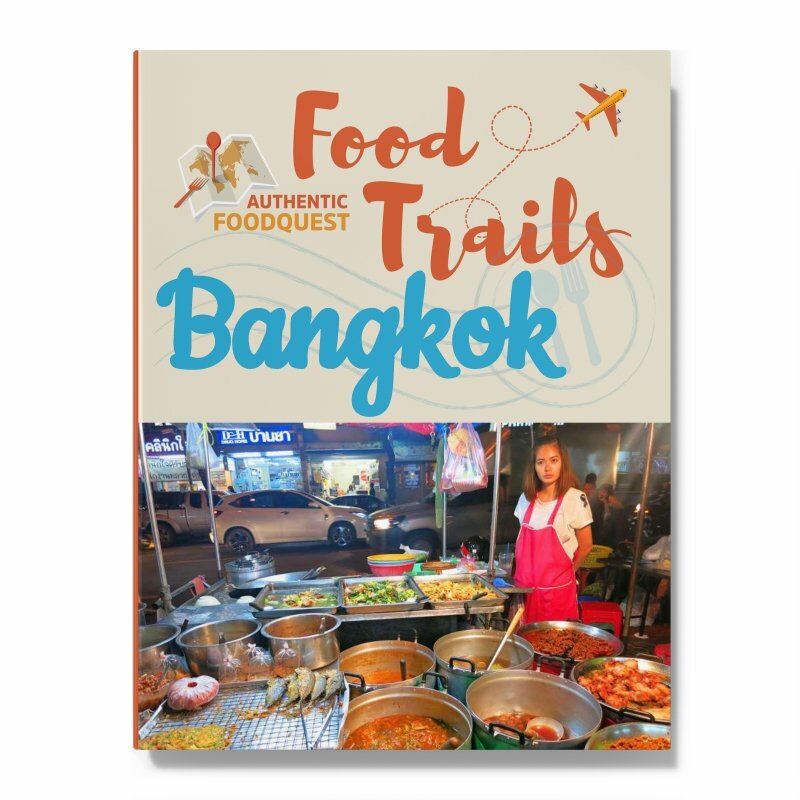 In Bangkok, you can easily find Thai Roti vendors on the famous backpacker road named Khao San Road. Depending on your choice of filling, the price for a roti varies between 15 baht to 35 baht ($0.42USD to $1USD). This is a perfect way to finish off your spicy meal with a touch of sweet. We first saw these tiny rolled up pancakes when visiting Wang Lang Market, one of the 7 Bangkok markets that will make you salivate. We were struck by the bright colors and unusual flavors. Typical flavors tend to be young coconut, taro, pandan or corn. We could not taste the individual flavors, except for the coconut flavor. Don’t miss out on these soft pancakes with crunchy sesame seeds. You will find these delicious Thai sweets sold at markets and street stalls. They come in various colors and are sold in packages of 6 for approximately 25 baht ($0.71USD). This sweet treat is traditionally Chinese, and it is quite unlike the coconut heavy desserts in Thailand. Instead, this dessert is made of round dumplings made of rice flour and stuffed with a black sesame paste in the inside. They are served swimming in a warm spicy ginger soup.The dumplings are soft and chewy and the ginger soup has a nice spicy bite to it. This is one of the popular desserts in Bangkok’s Chinatown, we discovered when taking a food tour in Bangkok at night. 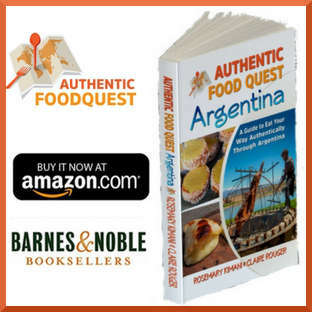 While the combination of flavors and textures is unusual, don’t hesitate to give it try on your travels. When you think of pumpkins, dessert is probably not the first thing that comes to mind. The first time we saw slices of pumpkins stuffed with a creamy filling, we were immediately intrigued. This very popular and unique Thailand dessert is a slice of pumpkin filled with custard. The pumpkin is cleaned and cooked ahead of time and all seeds are removed. It is then stuffed with creamy coconut custard and cut into slices for sale. While it is unusual to look up, it is actually really tasty, particularly because it is not too sweet. You will find this dessert at local markets or at street stalls. Take a bite of this unusual dessert in Thailand. The approximate cost per slice is between 10 baht ($0.28USD) and 15 baht ($0.43USD). Traditionally, desserts in Thailand are not made using eggs. This one Thailand dessert is a delicious exception. Made with egg yolk, sugar, rice flour, and jasmine water, these little balls are a special treat for events and festivities. While quite tasty, be warned as they are overwhelmingly sweet. You will find this treat in the sweets section of local markets throughout Thailand. Our favorite place for this Thai treat is Boonsap bakery in Bangkok, which is famous for their traditional desserts. We discovered this little gem while on a food tour in Bang Rak, one of Bangkok’s districts for having some of the best food. These little balls are sold in packages of 10 or 20 balls. The prices range from 7 baht to 10 baht ($0.20USD to $0.29USD) for smaller packages to 15 baht to 20 baht for larger packages ($0.43USD to $0.57USD). Thailand is home to a great variety of exotic fruits due to its tropical climate and fertile plains. As a results, you can taste many different types of delicious fruits. One unique fruit is mango and specifically green mango. As a dessert, it is simply cut into slices and topped with chili and powdered sugar. We highlight it here for its unique taste. A little bit bitter and not too sweet. Combined with the chili, it has a very nice bite, one that is quite unusual for a dessert. 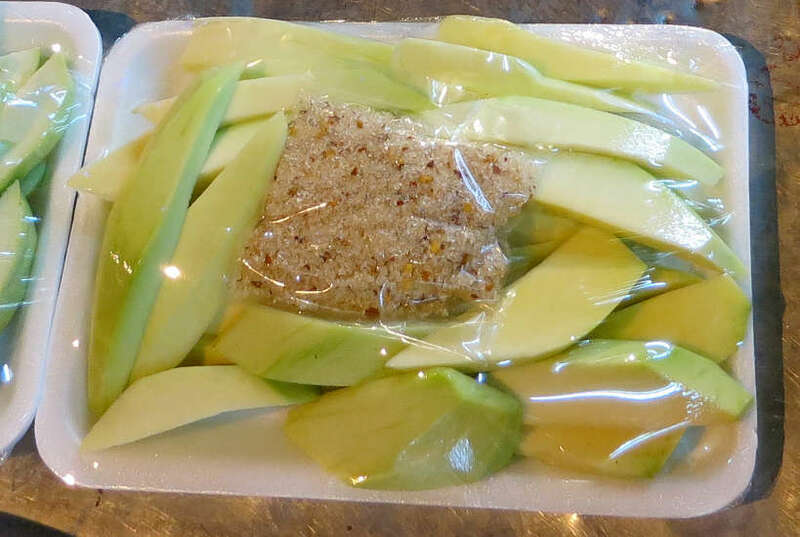 You will find the green mango dessert, already sliced and packaged at fruit stands in the markets or street carts. The average price is about 25 baht ($0.71USD). 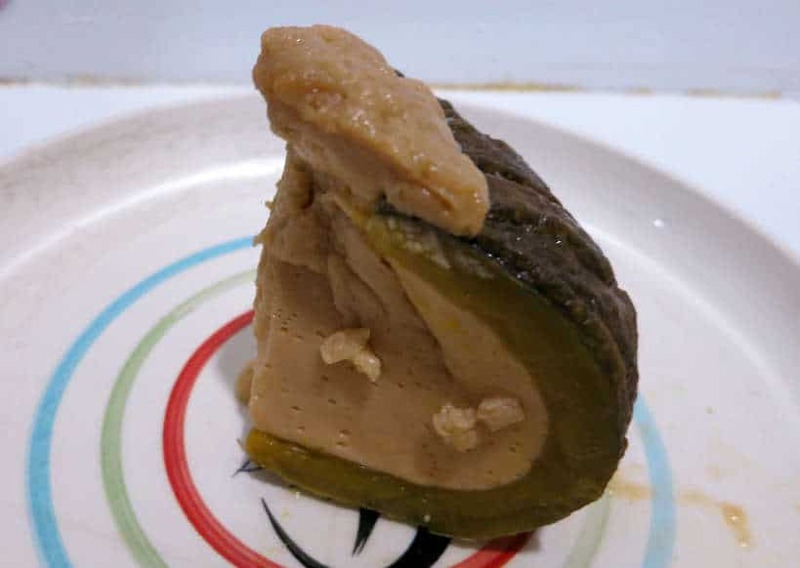 Mung Bean Cakes are a popular baked custard Thai dessert. They come in many different versions. Some versions, have very little starch, others are more eggy, delicate and flan-like, while others are firmer and starchier in texture, like brownies. Regardless of how you have them, you will enjoy the custard flavors and delicate texture. We enjoyed them best when they are simply browned on the top, rather than topped with shallots. 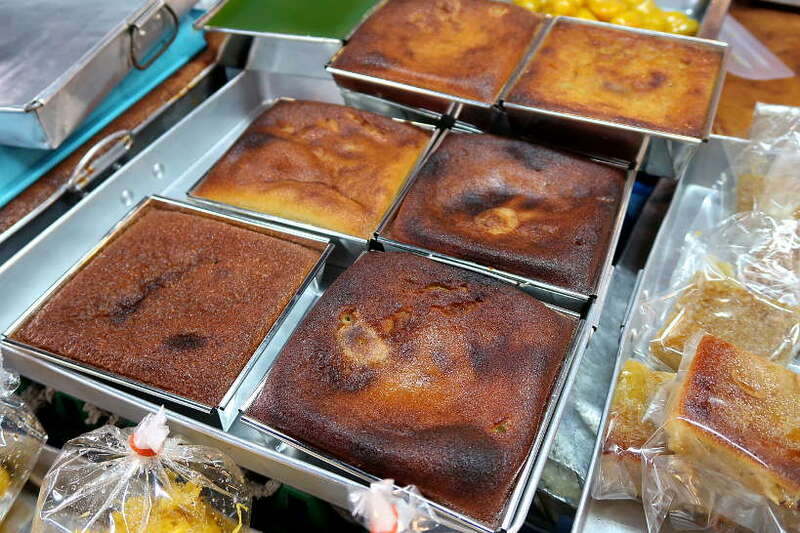 Mung Bean Cakes are sold by street vendors who typically have large selections of khanom or Thailand desserts. We found the best Mung Bean Cakes, freshly made, at Ton Payom Market in Chiang Mai. This market is a small local market located across from the Chiang Mai Art Center on the Southside corner. The lady that makes them has a stall inside the market, where she sells fresh mango sticky rice and many other Thailand desserts. A slice of Mung Bean Cake cost only 10 baht (about $0.32USD). These Thai-style coconut pancakes are a favorite street food. They are cooked on a hot griddle and served warm. These pancakes are made with rice flour and flavored with coconut and palm sugar. They are light and moist, with an airy texture. Bite-sized and delicious, it’s easy to eat several at a time. Khanom ba bin have their roots in special occasions and ceremonies, although you’ll find them everywhere today. These desserts are most popular in the regions of the country where coconuts are grown in abundance. In Ayutthaya, the formal royal capital, located just north of Bangkok, we had them while visiting a local Thai-Chinese market called San Chao Thong Market. We stopped at a stall where a lady had been making them for over 50 years. This particular vendor makes her coconut cakes “purple” using a local plant for natural coloring. 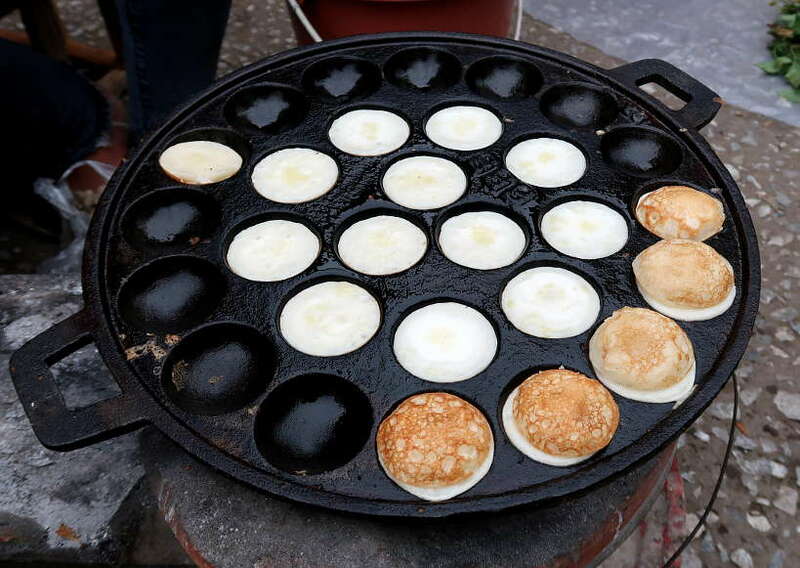 Outside of Ayutthaya, you’ll find similar desserts called kà-nǒm-krók, or coconut griddle cakes. These little cakes are cooked into little dishes and they come with a variety of toppings. You’ll find these at local markets or street stalls. In the morning or evening hours, don’t be surprised if you find yourself tempted by the sweet smell of the coconut pancakes cooking. Expect to pay about 10 baht ($0.20USD to $0.29USD) for six delightful pancake bites. Roti Sai Mai are typically associated with the ancient kingdom of Ayutthaya. They are small thin, colorful pan-fried pancakes flavored with pandan, strawberry or banana flavors. You stuff each roti or crepe with Thai-style candy floss or cotton candy which comes in a variety of colors. Served warm, the candy floss melt in your mouth. We had a lot of fun making these candy floss crepes. The colors are playful and the taste is sweet. 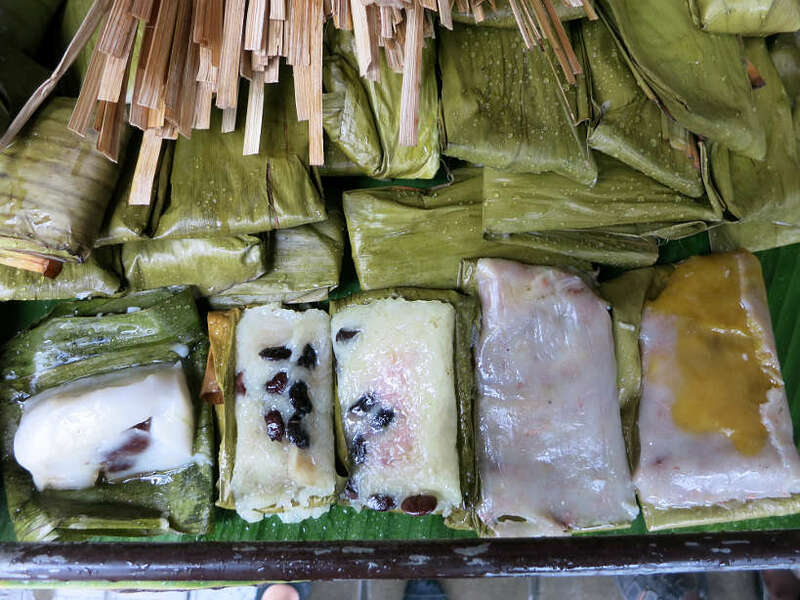 Don’t miss these Thai desserts while visiting Ayutthaya Historical Park. Roti Sai Mai is sold by street vendors typically Thai-Muslim, in and around Ayutthaya. The crepes are made in front of you. You can get a handful to go in a plastic bag with the palm sugar for about 30 baht (about $0.96 USD). 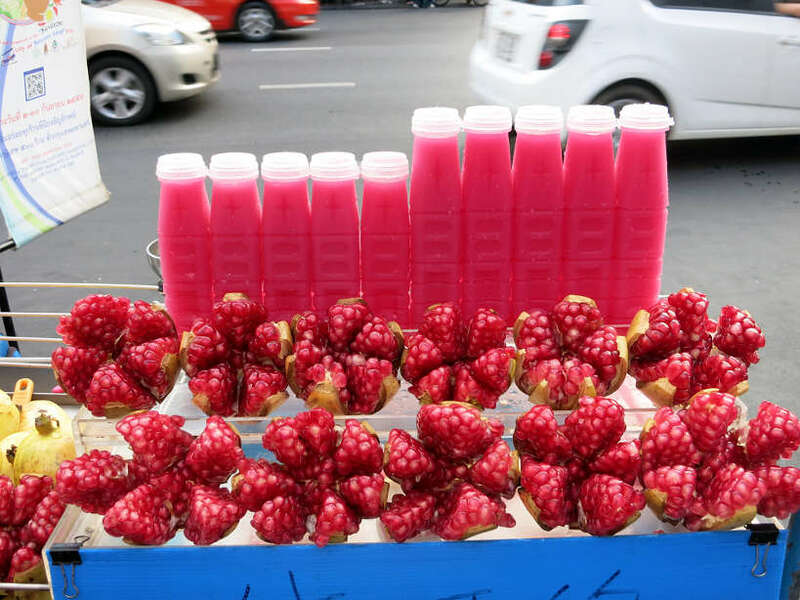 Almost anywhere you will go to in Thailand, you will find many stalls selling fresh fruit juices and shakes. As one of the hottest countries in the world, you will need to keep hydrated. 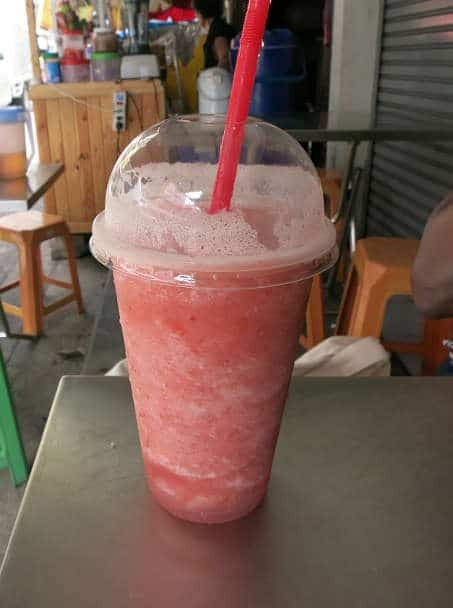 You will find vendors at markets or street corners making juices and shakes. Some of the juices are already bottled, while others can be made fresh for you. The shakes are always made to order and sometimes fresh fruits or frozen fruits are used. You will find interesting flavors including mango, orange, lime as well as exotic flavors like passion fruit, guava and pomegranate. For about 20 baht ($0.587USD) to 40 baht ($1.14USD) you can get a fresh bottle of juice or shake on the go. Thai desserts are an integral part of Thai cuisine. Naming all of them would fill a dictionary, and tasting all of them will take us several months and many additional pounds. 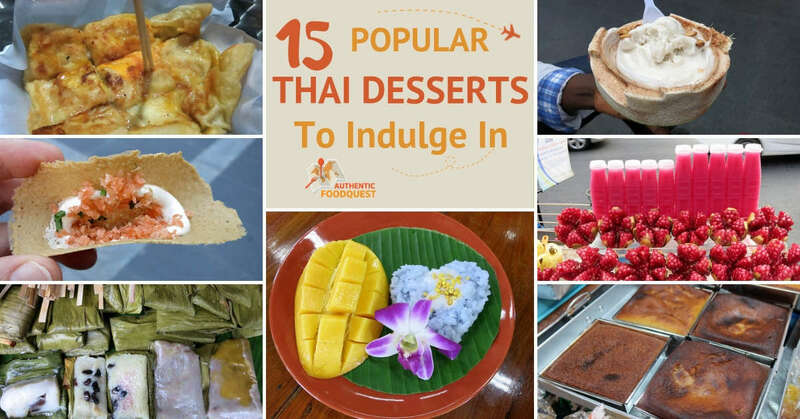 Through this concise Thai dessert list, we have introduced you to the 15 most popular kinds. These Thai sweets also incorporate the main ingredients found in most Thai desserts: rice, coconut, and fruits. The short video below takes you behind the scenes to see the making of some of these popular Thai desserts. We’d love to hear from you. Have you had any of these Thai desserts before? Which Thai dessert is your favorite? If not which Thai sweets would you like to try? Leave a comment below. We are huge fans of Thai food, but hadn’t heard about many of these desserts before. Those shakes look absolutely heavenly! 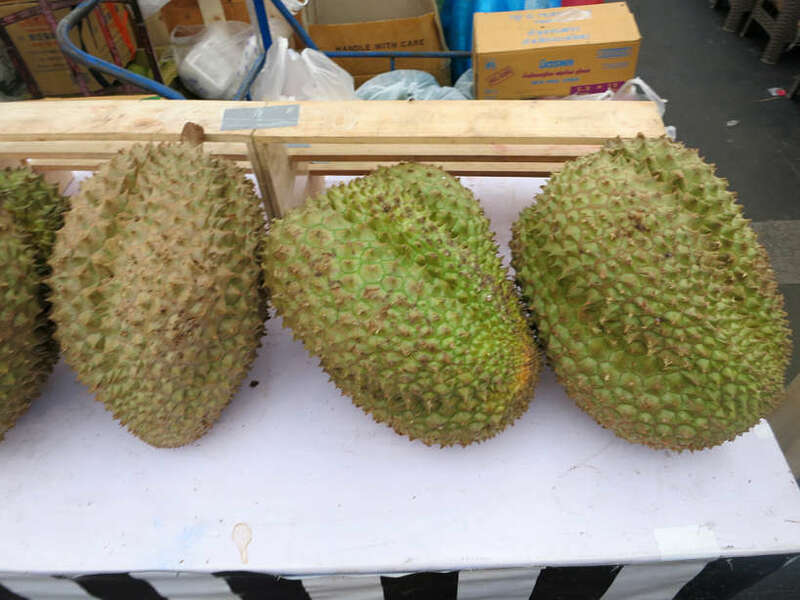 We wanted to try Durian last time we were in Costa Rica, but didn’t get the chance – we have heard that it really is the king of fruits. Thanks for sharing this fun post! Thanks so much and really happy you enjoyed reading the post. The next time you go for Thai, see what desserts they have available. You might be surprised to see some that are on this list 🙂 Indeed, do not miss out the next time you have a chance to try Durian. It is an experience!! Cheers! Rosemary and Claire, you guys are killing me. LOL. I should have saved reading this post until later tonight vs at 8:35 am because none of the Thai places near me are open. So instead I have to sit, drooling over all the photos of these Thai desserts but can’t have any for the next 2 1/2 hours. Sticky rice and coconut ice cream are my favorites. I’ve yet to try Filled Coconut Cream and don’t remember seeing it on the menu of the places in my area. I’ll have to call around and see if anyone serves it. Thanks for a fun list of Thai desserts to try. I know what I’m having for lunch today! Awesome to hear Debra..the intent was to whet your appetite with delicious Thai treats 🙂 What did you end up having? The coconut cream ended up being on my favorites (I’m partial to all things coconut). Highly recommend for your next trip to Thailand. Cheers. So glad you enjoyed this tantalizing post. Any particular favorites? So glad you enjoyed this tantalizing post. Any particular favorites? Thanks for stopping by. Well, in my opinion, if it is Thai, then it is delicious! I love that this list isn’t just the typical dishes, but I am going to have to disagree with the Durian rice! I know, I know…one of those “love it or hate it” tastes, but I hate it! Glad you enjoyed the article and the selection of desserts. You are right, Durian is polarizing. I’m personally learning to love it…especially in a myriad of different things such as ice cream, snacks, treats, etc. Appreciate your feedback LeAnna. OMG the Thai Mango sticky rice sounds amazing! I LOVE mango (and not spicy food) so this is probably the first thing I’d try if I ever made it to Thailand. The mango sticky rice is amazing…yes for sure, you will love it. Keep in mind Tamara that you can get dishes that are not spicy and you can also ask for cook to hold the chilis. Not all Thai food is spicy:) Cheers! This is a great post, we were in Thailand in November and particularly liked the ice cream. As for the durian rice, how did you find the smell? That’s awesome you were in Bangkok recently. Did you try many of the desserts on this list? The durian ice cream was quite tasty. The smell does not really bother us at all…the taste is what matters and it’s interesting and good!! Thanks Suze!! You can’t go wrong with the mango sticky rice at all. Though the others are worth trying as well 🙂 Thanks Melody for your comments. I enjoyed most of these sweets during our nearly 2 year stay – collectively – in Thailand. Heading back to Chiang Mai next month. Fave roti ladies; Muslim stand and restaurant on Chiang Mai Lamphun Road by CM Riverside apartments. Brilliant banana roti. Banana shakes! Our fave Thai sweet treat. We enjoy ’em all over Chiang Mai and Bangkok and had delish shakes in Koh Lanta too. Brilliant homemade passion fruit juice – served in those little plastic bottles seen above – in Phuket vegetarian restaurants among other spots. You will have a blast in Chiang Mai. We enjoyed one month discovering the city and really enjoyed it. We enjoyed the banana roti’s all over the place. We’ll have to try your reco the next time we are in Chiang Mai. Yes, the drinks and shakes….mmmmm good!! Thanks Ryan and have a wonderful time in CM. I don’t know much about Thai food, but I would never have thought about the desserts! I definitely have to try the mango sticky rice at some point, it sounds super delicious! If you are not familiar with Thai desserts, mango sticky rice is the perfect introduction. Be warned, easily addictive. Thanks Samantha. MMMM… I lived in Thailand for awhile and I would give my left arm for some perfect mango sticky rice right now. I never tried durian fruit because the smell scared me away, but maybe the next time I go back! I have never seen the bamboo sticky rice!!! I MUST try that one…gonna head to Warorot soon!!! I love sticky rice! Love sticky rice and mango but not a fan of durian 🙂 I have tried the sesame pancakes and they are chewy but ok tasting, to me 🙂 That roti, though! That’s just too good! Yes, I’m a bit crazy for dessert LOL P.s. hope you gals are doing great! What…for all the time you’ve spent in Thailand you haven’t tried the bamboo sticky rice!!! Head over to Warorot immediately 🙂 Try durian as well. Not bad at all. The roti…as you said, too good!! Lot’s of wonderful desserts to experience and enjoy in Thailand. We are doing great and it was fab meeting you guys! Cheers Taiss! Yes, we were quite impressed with the amazing list of desserts in Thailand. Save this article for your next trip to Thailand. Coconut is in many desserts…you will be in dessert heaven! Let us know what delicious coconut desserts you discover. Cheers! 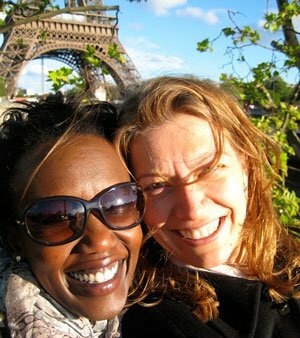 It’s often all too easy to forget that other cultures are so different from our own. Thailand is somewhere that I really want to visit in the next couple of years so now I know what desserts to look out for and try. Thank you for sharing! Yum! I’d want to try all of these. Everything sounds amazing and I don’t think I’ve tried any of the desserts. I’d especially love the strawberry shake. The desserts in Thailand are truly divine. You will have a delicious experience eating your way through the desserts. The shakes come in many flavors with unique and exotic fruits. Pin this post for your future trip to Thailand. Thanks Amber. I love trying different culture’s foods, especially desserts. It’s like a journey to another place that you may not get to visit otherwise. Thanks for letting us know about these desserts! You are so right Beth. Do check out any of these desserts at a Thai restaurant close to you. Glad you enjoyed the article and learning about the desserts. Cheers! That’s awesome to hear Jain. There is indeed much to enjoy in terms of sweet treats in Thailand. Appreciate your comments. These are making my mouth water! I love mango sticky rice and I’d have it whenever I’m visiting a Thai restaurant here in Canada! Thanks for sharing! That’s awesome to hear Stephanie that your local Thai restaurant in Canada had mango sticky rice. Next time, try another dessert from this list and let us know what you discover. Cheers! The mangoes in Thailand are just so delicious aren’t they! When I backpacked around Thailand I never got fed up of Mango and yogurt for breakfast. I actually hadn’t realized that there were so many delicious dessert options though – guess I missed out! Indeed the mangoes in the Thailand are quite exceptional. Keep this article for your next trip. There is much more to discover beyond the mangoes. Appreciate your feedback,Jay! Indeed the mangoes in the Thailand are quite exceptional. Keep this article for your next trip. There is much more to discover beyond the mangoes. Appreciate your feedback, Jay! Thanks so much Becky. Really appreciate your comments about the article. Indeed, bamboo sticky rice is perfect for traveling. Do try the other desserts out and let us know what you think 🙂 Cheers. Thanks so much. When do you head out to Thailand? Please do let us know if you have any questions regarding the desserts. You will love the roti…made fresh and handed to you warm….delicious!!!! Cheers. Perfect Lyn, do keep this article for future reference. It is worth not missing out on any of these delightful treats. Cheers. Thanks so much Rachel. Appreciate your feedback. Yes, do save this article for your future trip. It is going to be well worth the experience. Happy eating. I can’t wait to visit! All of the desserts look amazing. I can’t wait to try them. 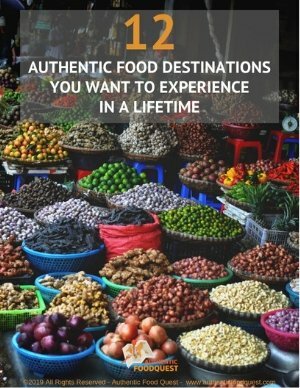 Prepare yourself for a wonderful dessert journey through Thailand. Indeed, keep this for future reference. Thanks for stopping by. So glad you enjoyed the post Stacey. The food in general and the desserts specifically, do warrant a trip to Thailand. Nevertheless, stop by your local Thai restaurant and see what they have from this list, that you can try. Do let us know. Cheers! Sticky rice is my absolute favorite! When it’s covered in coconut milk and sugar, it’s just so flippin’ delicious! We could not agree more, Divya. That’s the perfect combination of sweet treats 🙂 Cheers. I’d love to try any of these. They look yummy. I think I’ve had sticky rice before. Thanks Valerie, the next time you are doing out to eat, choose a Thai restaurant and order a dessert. You will be surprised at what you will discover. Please do let us know 🙂 Cheers. That Thai Roti got me drooling! Completely understandable. The Thai roti is incredibly delicious 🙂 Hope you can get to Thailand soon and try it for yourself. Thanks for stopping by. wow so many deserts! I wonder how they prepare and cook those bamboo sticky rice. I also like those bottled pomegranate juice! There are so many dessert choices in Thailand. Plenty to keep you eating sweets for several months, if not years 🙂 Hope you can make it to Thailand soon and enjoy all the tasty treats. Thanks Blair. Thai Ice cream is the ABSOLUTE Best I’ve had anywhere! I was so sad I discovered the last day of my trip. I would have ate it everyday. Great list! So glad you like the selection of desserts. It is our goal to highlight the local treats so that you don’t discover them on the last day of your trip. Now you know and you are well prepared for your next trip to Thailand. Thanks Jewels! This gorgeous post made me miss Thailand so bad. That coconut ice cream, goodness me! Thanks Serena for your comments. In the heat, the coconut ice cream is the perfect antidote to the heat. Appreciate you stopping by. I’ve eaten mango sticky rice and bamboo sticky rice which I both loved!! Coconut icecream was a let down for me. I haven’t even heard of the others though, but I will look out for them next time I visit these places! Glad you are alreadylove some of the Thai desserts. It’s too dad that the coconut ice cream was a let down for you. Check out the places recommended and see if you feel differently 🙂 Thanks, Chloe for stopping by. 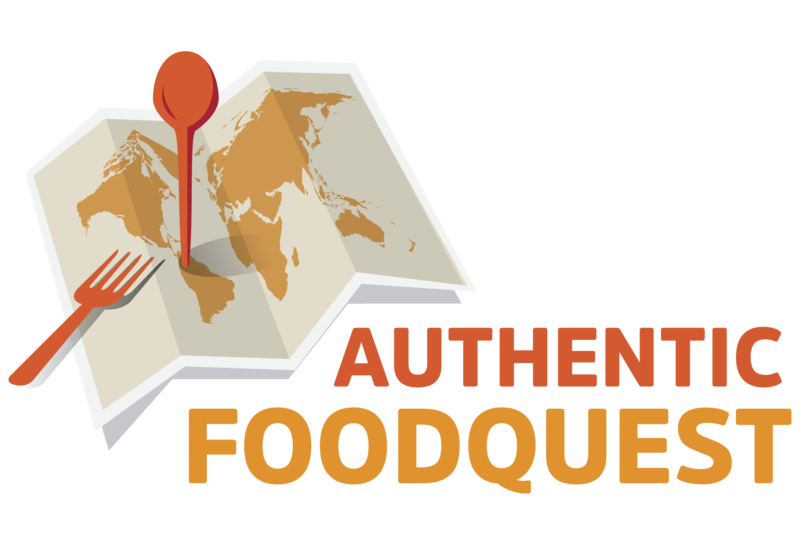 Our goal at authentic food quest is to demystify foods, particularly the local specialties. 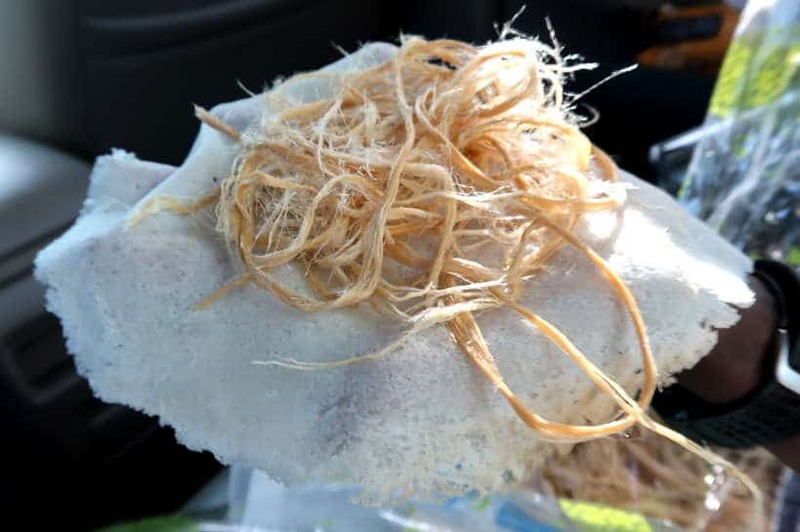 Bamboo sticky rice may look weird, but it is quite interesting. Let us know if you find it at your local Thai food restaurant. Cheers! 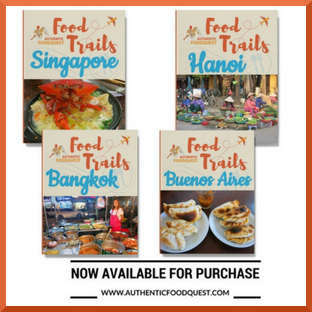 That’s awesome Miyuki, indeed, do think of this as your local and authentic guide to Thai desserts in Thailand. Thanks for stopping by! What a great list. I don’t even know what I’d wanna try first. I love Thai food as it is so I’m sure I’d devour desserts! Thai desserts are a perfect finish to the spicy Thai dishes. Yes, you will devour the desserts 🙂 Thansk Roxy! Thai desserts are a perfect finish to the spicy Thai dishes. Yes, you will devour the desserts 🙂 Thanks Roxy! Hi there ! so delicious post ! 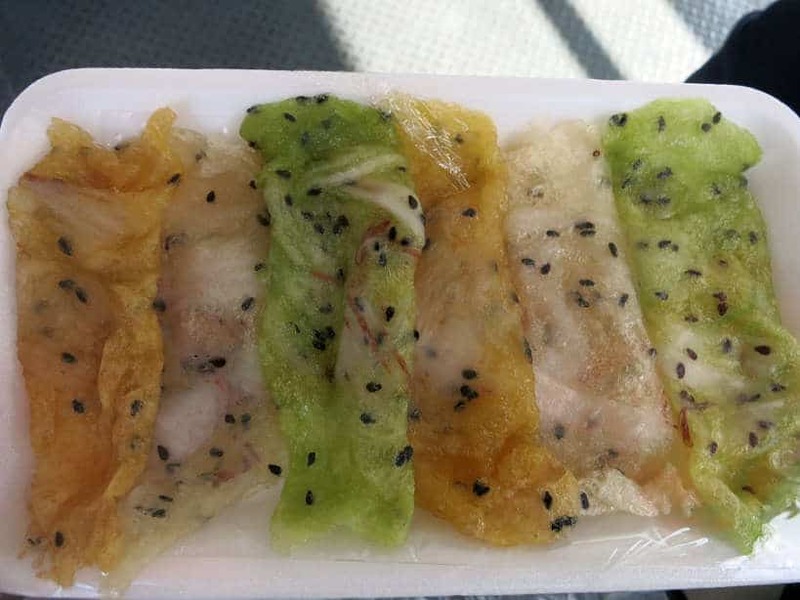 My favourite is undoubtly the sticky rice cake with banana filling. 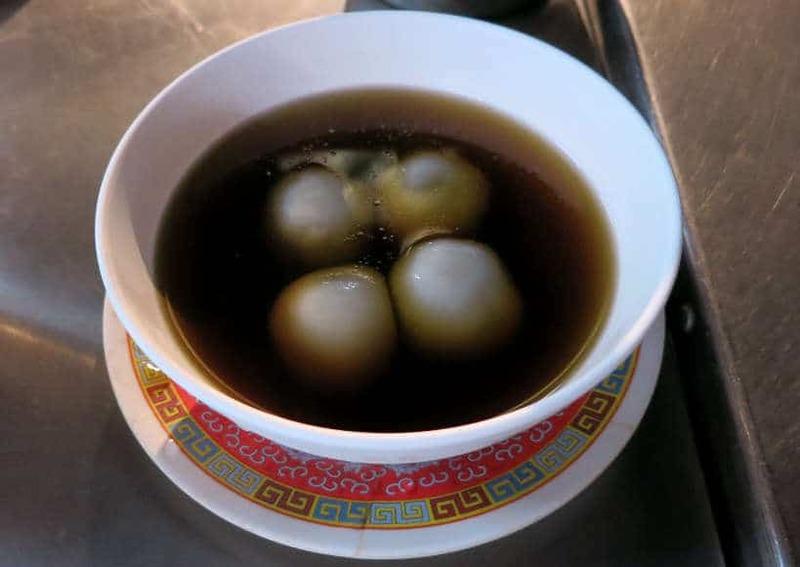 I also like very much the black sesame dumplings in ginger soup but in the vietnamese version called “Chè Trôi Nước”. The dumplings are filled with soybean instead of black sesame. The soup is a light caramel syrup flavoured with sliced ginger and sesame seeds. Wow, all so stunning! I hope I could try to eat that Bamboo sticky rice and Thai Sticky Rice Cake too. It looks so delicious, you made me feel so hungry. So glad you enjoyed the article and the tempting Thai desserts. They are all absolutely delicious. Thanks for stopping by!! That’s awesome to find another Thai food lover. What’s your Thai favorite dessert? Thanks Chloe for stopping by. As someone who has many food allergies, I love that so much of these thai desserts use rice and coconut milk as the base. I am a huge fan of mango sticky rice – I swear I could eat it at every meal! Could not disagree with you. There is always room for mango sticky rice 🙂 Thanks, Tessa. Thai desserts are definitively worth traveling to Thailand for. Did you have a favorite, other than the durian (which is actually quite good)? Let us know, Jodi. Oh wow! These all look delicious! This post made me salivate! I also love the educational background it provided on Thai desserts. I’ve had a few, including Thai ice cream and mango sticky rice, as I live in the heart of Thai town, but I’d love to try all of them and would love to go to Bangkok! Love to read your article. Definitely, I will try the popular thai desserts. Thanks so much Stella. Did you have a favorite Thai dessert?